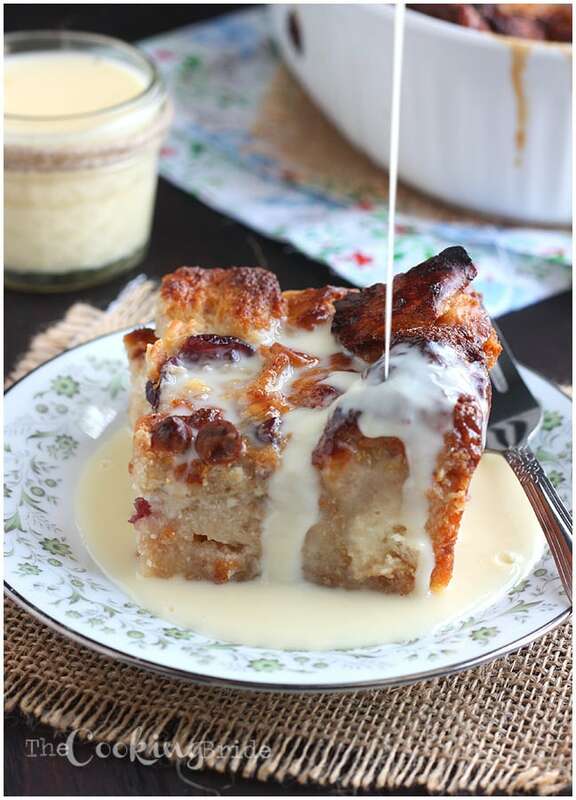 Cranberry White Chocolate Bread Pudding is over the top delicious with dried cranberries and white chocolate chips and drizzled with warm rum creme anglaise sauce. This post may contain affiliate links. Click here to learn more about how affiliate links are used on this site. A few years ago, I was asked to cover an event for one of the magazines I write for. It was a bread pudding competition among local chefs here in Jackson. Proceeds went to charity. Afterwards I interviewed the winning chef – Andy Cook, owner of a fantastic BBQ restaurant in town called the Pig & Pint. Andy was gracious enough to share the recipe. one thing I have noticed with professional chefs – just because they make great food doesn’t mean they are the best recipe writers. A lot of times they are cooking off the cuff so they aren’t thinking about exact measurements and step-by-step directions. And the recipe was written for feeding a huge crowd, so I had to make some adjustments and scale it back lest we would be eating bread pudding every night for a week (you can easily double this, though, if you are serving this to a crowd). You want a good sturdy bread that won’t fall apart after it has been soaked. Choose something like crusty French bread or brioche. If you can get your hands on some Jewish Challah, that would work great as well. Start by tearing the bread into cubes. You’ll need about 10 cups of torn bread for this recipe. Place them in a large bowl. Then whisk together one cup each of heavy cream and milk, four large eggs, 3/4 cup of sugar, an entire bag of white chocolate chips and 3/4 cup of cranberry sauce. When it comes to the cranberry sauce, look for whole berry cranberry sauce, not the jellied stuff shaped like the inside of a can. Pour the wet ingredients over the cubed bread. Gently stir until the bread is good and coated. Cover and let the bread sit in the fridge for a minimum of one hour, but up to 12 hours is ideal. Preheat your oven to 350 degrees. Coat a 9 x 12 x 2 inch casserole dish with cooking spray. Pour the soaked bread into the casserole dish and spread it around until it is in an even layer. 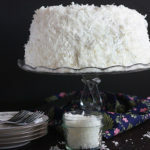 Sprinkl the top with two tablespoons of white sugar. Bake the bread pudding for about 1 1/2 – 2 hours until the top is golden brown and the center is not watery. If the top of the pudding begins to brown too quickly, loosely cover it with aluminum foil and continue backing. Do not skip out on the rum crème anglaise. It makes the dish and honestly, I could eat it with a spoon like pudding. If you are serving little ones, substitute the rum in the crème anglaise with rum extract. You’ll still get the rum taste without worrying you might intoxicate your sister’s kids. Though I don’t know your sister’s kids. Or your kids, for that matter. You might welcome a little mellow buzz. I did not just say that. An anglaise is a fancy name for a thin custard used as a sauce. It is a mix of sugar, egg yolks, milk and vanilla. Whisk together two cups of heavy cream in a large saucepan with 3/4 cup sugar and one teaspoon of vanilla extract. Bring to a simmer, then continue to simmer until the liquid reaches 145 degrees. A candy thermometer will help ensure you don’t scald your milk. Once you’ve reached 145 degrees, remove the pan from the heat. Have your egg yolks slightly beaten and waiting to the side in a medium mixing bowl. Slowly whisk half of the hot cream mixture into the egg yolks. You will want to be whisking constantly while you to this. What we’re going here is tempering our eggs. That means we are slowly raising the temperature of the egg yolks so they stay creamy when we add them to the hot liquid. If we did it the other way around, and just added the egg yolks straight to the hot pan, we would end up with bits of scrambled egg in our sauce. Yuck. Once the eggs are tempered, you can add the rest of the cream sauce. Set the sauce aside to cool completely. The sauce will continue to thicken as it cools. Stir in the rum or rum extract right before serving. 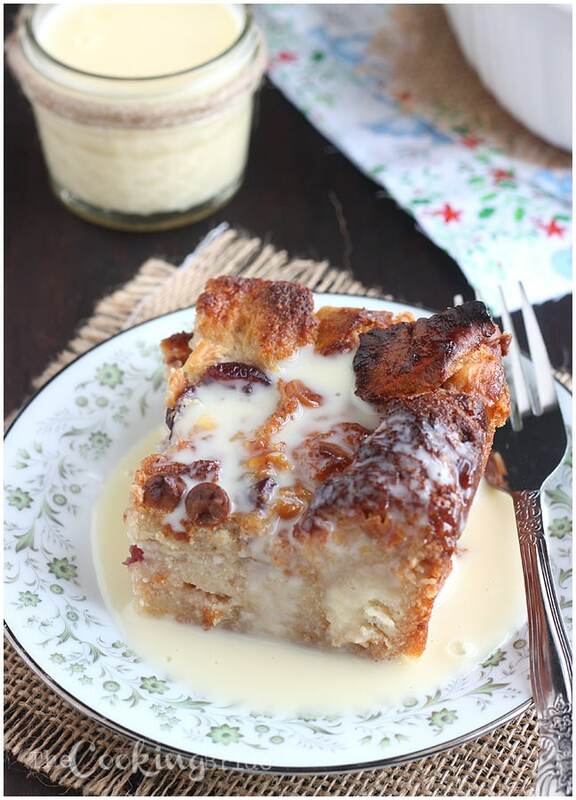 You’ll want to serve Cranberry White Chocolate Bread Pudding hot from the oven. 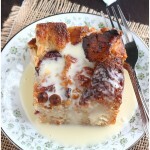 Cut the bread pudding into individual servings and pour that yummy creme anglaise sauce right over the top. Cranberry White Chocolate Bread Pudding is over the top. What I mean is, it’s the best bread pudding I’ve ever eaten. It has that warm, gooey, comforting texture with the hint of white chocolate in every bite. Combine all the ingredients except the bread in a large mixing bowl. Whisk together thoroughly. Add bread and mix until bread is moist. Allow bread to soak for 1 hour, or up to 12 hours. Coat an 8 x 8 x 2 baking dish with non-stick cooking spray. Pour bread mixture into the pan. Sprinkle with the remaining 2 tablespoons of sugar. Bake for 1 -1 ½ hours until bread is golden on top and bread pudding is not water in the center. Top with rum crème anglaise sauce. Combine all ingredients except the egg yolks in a medium saucepan. Bring to a simmer. Cook until mixture reached 145 degrees when measure with a candy thermometer. Remove from heat. Break egg yolks into a medium mixing bowl. SLOWLY whisk half of the hot crème mixture into the egg yolks, whisking constantly. Once eggs have been tempered, add the remaining crème mixture. Set crème anglaise aside to cool. Mixture will thicken as it cools. Add rum or rum extract to taste. Recipe can be doubled. If doubling, use a 9 x 13 x 2 baking dish. Join 8,900 other hungry folks who receive FREE meal plans and recipes every week! I’m so in love with this bread pudding!!! I would love some right now! How do you measure ten cups of bread it is so airy? Hi Lori, it doesn’t need to be packed down. I use a big 4 cup measuring cup to measure it. It doesn’t have to be precise. 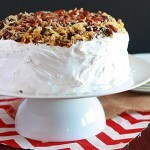 This looks delicious, and that rum creme anglaise sounds like the perfect topping! I love this recipe and it’s perfect for this time of year. I don’t like Christmas pudding or Christmas cake but cranberries are so seasonal that this would work perfectly as an alternative for me on the big day! 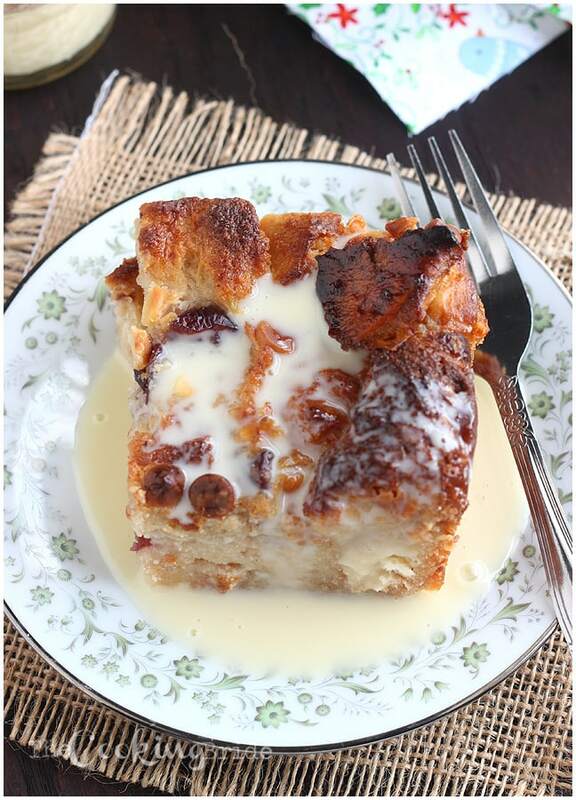 This bread pudding has all the right flavors to be the perfect dessert for the holidays. This is my kind of dessert. It’s going in the recipe box for next month. My family will be delighted with this dessert! It look so yummy! I want to try it immediately. Wonderful combination of ingredients. Looks VERY tasty! 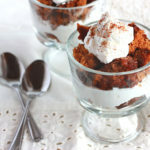 I LOVE bread pudding!!! 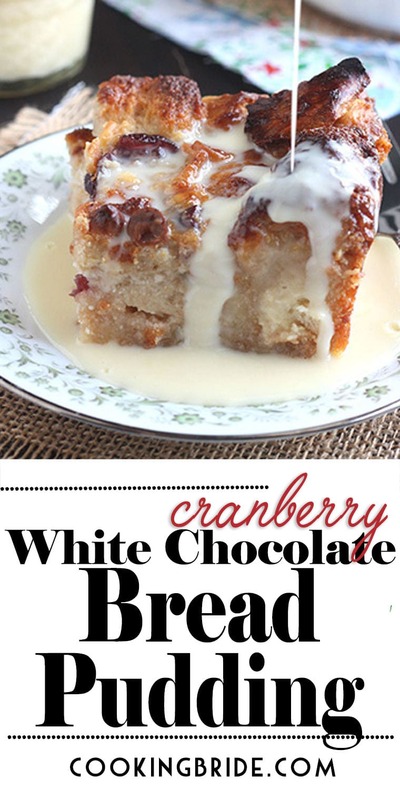 Adding cranberries and white chocolate is genuis, adds such a beautiful holiday vibe to the recipe! Who Is the Woman Under the Veil?